Intensifying repression is not ‘SAMADHAN’. Tribals are the true offspring of the Mother Nature as they live in perfect harmony with her. Unlike their city counterparts, who are entranced by the glittering mirage of consumerism, they lead frugal, self-contented and sustainable lives. As they are the ‘Aadivasis’ they have the true entitlement over the forests. But these forests and the people who dwell in them could not escape the eyes of the capitalist profit mongers. They are well aware of the fact that the forests, though seemingly frugal, are not only clothed in pristine greenery but also have rich mineral resources in their belly. They have been trying to disrobe the forests of their flora and even disembowel and cart off with the mineral resources, such as iron ore and bauxite to further amass their wealth. History is replete with instances where mining turned out to be a scandalous activity and criminalized the society and politics in addition to resulting in exploitation and rights violations. It is a fact that the governments rarely bothered about tribal welfare and never intervened to protect them from exploitation except making some legislations such as Forests Rights Acts (FRA) and Panchayats (Extension to Scheduled Areas) Act (PESA). However, they don’t appear to be serious about implementing the laws in letter and spirit. The innocent tribals, faced with the prospect of getting displaced from their lands and losing their livelihoods, started resisting the attempts of the greedy capitalists to intrude into their forests. Not able to find support from any quarter, a large number of tribals got attracted towards Maoists to safeguard their rights over land, forest and water (Jal-Jungle-Jameen). As a result of their seeming proximity to Naxals, their lives became precarious and are caught in the crossfire between the Naxalites and the police. Many state governments such as Chhattisgarh, Odisha and Jharkhand are signing MOUs with mining companies unilaterally without involving the tribal communities in the decision making. And it is all happening in the name of development, in which the tribals don’t have any stake at all. It is a well-known fact that in a capitalist society development fills the pockets of only a handful of people and the so-called ‘trickle-down effect’ is sparsely seen. We are all the mute witnesses to the phenomenon where just 57 billionaires in India now own as much wealth as the bottom 70% population of the country. And in the process of satiating their unending lust for wealth, they poisoned all the natural resources which resulted in the overall deterioration in the quality of life. 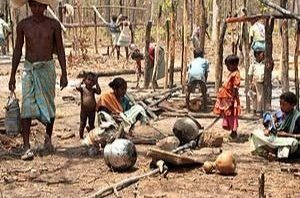 The union government, after indulging in repression in the name of Operation Green Hunt, is bracing itself for a fresh bout of onslaught against tribals on the pretext of exterminating the Naxals. However, the true intention behind this offensive appears to be forcing the tribals into submission and unleashing the corporate houses into the forests. The new instrument of repression they unveiled this time is ‘SAMADHAN’, an acronym for many things that are smart and cutting edge, and one of those things is ‘Dashboard based KPIs and KRAs’ which we normally hear in corporate boardrooms. Corporate managers, when they use dashboard based KPIs and KRAs, quantify everything by using some yardsticks. So how the government is going to measure their success in suppressing the resistance put up by the tribals? By counting the number of scalps taken? The usage of dashboards also involves suitably rewarding the best performers. So how the police and paramilitary forces will be rewarded? By giving promotions and offering cash incentives for every scalp taken from a Naxalite or a so-called Naxalite? That will be an extremely dangerous situation. If that is the case, every tribal who refuses to toe their line will be branded as a Naxal and shot dead to claim bravery awards and cash rewards. The government should realize the fact that dashboards and KPIs are not the panacea to all the problems. In spite of using dashboard based KPIs, the big corporations, from time to time, knock at the doors of the governments seeking to be bailed out with tax payer’s money. Recently the union government wrote off 1.14 lakh crores of loans to the wealthy business tycoons enabling them to enjoy the ‘riskless capitalism’. Before unleashing the paramilitary forces against the tribals the governments have to introspect. It is the crony capitalism and corruption infested unresponsive governance that is mainly responsible for the emergence of Naxalism. The poor governance has inflicted untold misery on tribals, Dalits, minorities and other economically weaker sections and transformed the entire nation into a fiefdom of politicians and industrialists. They are ruling the roost marginalizing all the vulnerable sections. It is exactly this that gave rise to Naxalism. Smart weapons and cutting edge technology can’t bully the people who are fighting for their lands and livelihoods. Therefore, India’s ruling class, instead of flexing its muscles against its own people, must do something to alleviate their suffering. Naxalism must be treated as a socio-economic problem and dealt with accordingly. Any effort to brand it as ‘the greatest internal security threat’ will only aggravate the problem and will invariably have cataclysmic effects on the entire nation. Therefore, the governments, setting aside their plans to suppress the resistance put up by the tribals, should make them a major stake holder in any developmental projects in the forests. Before signing any MOUs they should also think about the environmental impact, as tribals are used to sustainable living. They should also renounce their infatuation to Dalal Street and formulate policies to improve the living standards of the masses. Any attempts to intensify the repression will only transform India into a police state and will ultimately end up strengthening the Naxalism. This entry was posted in Politics and tagged Naxalism, repression, Samadhan, Tribals on August 1, 2017 by Dr. Ramachandra Reddy.